While much of the impulse for the development and dissemination of MCR has come from the NGO sector, the technology is sustainable far beyond any initial project funding. Small successful tile businesses, many family enterprises, have contributed to the economic dynamism of their local building materials market for over a decade. One could say, money well-invested, or even minimum risk. 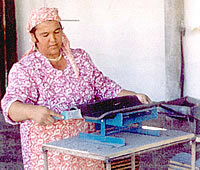 Women have proven to be excellent tile-makers, in countries as far afield as El Salvador, Namibia and Tajikistan. Stimulating local economies is a direct contribution to the process of development. The opportunities for small businesses that exist with MCR, when properly introduced has been demonstrated time and again, whether in formal or informal markets. While there have been unsuccessful workshops, usually they were not commercially conceived in the beginning, or did not have proper equipment and adequate technical assistance. Such situations are precisely the concerns of the EcoSouth Network. In fact, the network developed out of the preoccupations of early producers and organizations in eleven Latin American countries. Thus, EcoSouth seeks to provide the necessary technical assistance to new producers and housing projects, to encourage market-oriented tile workshops, and to provide top quality equipment.